Rail passengers at Halifax Train Station. 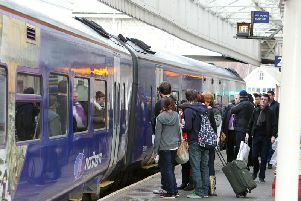 Yorkshire rail passengers were today promised a fleet of new trains as the Government asked companies to bid for the right to run services across the North. Bidders for the northern and transpennine rail franchises will be expected to add more than 200 train services. The Department for Transport said the northern rail franchise holder would be expected to “replace outdated Pacer trains” although it was not immediately clear whether that will mean all the trains dubbed “buses on rails” will be scrapped. According to the documents inviting companies to bid, the winning bidder of the northern franchise - which covers the bulk of local services in Yorkshire - will be expected to order “at least 120 new-build carriages” and double the number of services “on many routes”. The franchise holder will also be expected to invest at least £30 million in stations and introduce free wi-fi on all trains by 2020. The Government wants the winner of the transpennine franchise to introduce extra capacity, earlier and later services, more services on Sundays and look at introducing connections to Scotland. Deputy Prime Minister Nick Clegg said: “This is an historic moment for the North. Improving rail links in the region has been much anticipated.